With the New Year comes a fresh start, but in many cases our past likes to follow us online in the search results, especially on Google. That’s where online reputation management is needed to displace negative results with more favorable positive mentions and notable achievements. In an effort to better understand the types of content users prefer when evaluating companies, brands, and individuals, we’re working on a series of posts and independent research that will hopefully provide interesting insights that we can all apply to the demands of a modern, Google-powered world. When looking for an authoritative list of CEOs and brands, where better to start than Forbes? Every year they put together a series of lists that document the top performing CEOs, companies, richest Americans, world’s billionaires, etc. I decided to take a closer look at those top 10 highest earning CEOs to see what kinds of reputation management insights we could learn from these powerful individuals. 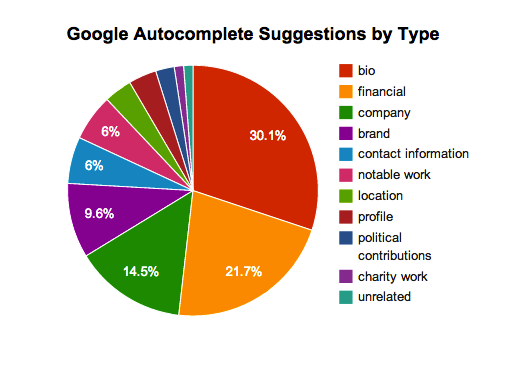 For this post I’m focusing entirely on their Google autocomplete suggestions broken down by “type” and “keyword.” Google autocomplete suggestions are driven by search behavior–the frequency of searches for a particular or related keyword, the content discovered by Google for that keyword, personalization based on the searcher’s behavior and location, and any recent news for the particular keyword. The most shocking discovery is that a search for each of their names returned no obviously negative autocomplete suggestions though one CEO’s email address was being searched for by consumers who wanted to submit a customer service complaint. What I mean by no obviously negative suggestions is that at no point did anyone’s name appear beside the keywords of “scandal,” “fraud,” “scam,” “affair,” “arrest,” “lawsuit,” “doping,” “doping evidence,” etc. The latter two did however appear for a certain cyclist. You don’t get to the top without causing a stir at some point, but once you’re at the top, there is so much newsworthy content (in the case of our top earning CEOs, positive content) that it’s difficult for a single negative review or blogger to overtake the empire you’ve built–unless news of Oprah-worthy proportions breaks. 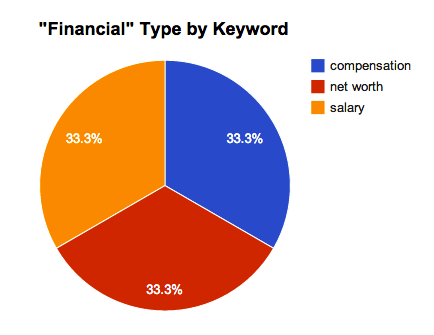 Searchers are obsessed with the biographical and financial information of CEOs. We want to know how they got to where they are and what they’re making/worth. The “brand” category looks like a larger percent than it truly is because of Ralph Lauren. He is the only CEO who named his company after himself, which means his autocomplete suggestions are weighted entirely to the brand versus the individual. While I haven’t dug into the individual search results of each CEO, yet, this appears to be a very smart move for online reputation management though it extends to much larger considerations for the brand itself. The only difficulty Ralph Lauren might have with his search results is getting users to find information relevant to him versus the company itself. We can see that all of the mentions are a division of the parent company or a location search such as the mention of “outlet” and “outlet Lake George,” which is a personalized suggestion based on my location in upstate New York. Likely, the Ralph Lauren store nearest you is being suggested as well. Being on the Forbes list generates autocomplete suggestions for the Forbes list. Once you’re on the list, buzz follows and in several instances, which were grouped as “profile” the CEO’s name appeared next to a search for “Forbes” simply due to the notoriety of the list and curiosity of where they might fall. Charity work only appeared for one person, which was a foundation named after the CEO himself–The Kinder Foundation. I personally found this shocking and would hope that all of the CEOs are actively involved in non-profit work though they may not have named their contributions/foundations after themselves, which explains why these aren’t appearing as highly searched keywords for the CEO’s name. Priceline CEO, Jeffery H. Boyd’s suggestions were (like Ralph Lauren) unnaturally weighting the contact information keywords. There were several searches for his contact info and email address. This appears to be fueled by consumer complaint sites who want to reach out to the CEO directly about a concern. Gilead Sciences’ CEO, John C. Martin is brilliant. Like Ralph Lauren and Jeffery H. Boyd, he held down the “notable works” type entirely on his own thanks to his book, “Introduction to Languages and the Theory of Computation.” I love this. It demonstrates that as a CEO you don’t have to just invest in the development of your company, you can keep producing your own unique research or perhaps a book or documentary that drives positive searches and credibility within your industry. I learned the most from Mr. Martin. Political contributions–we want to know where those top earning CEO’s dollars are going and it’s publicly available, so why not look it up? This no doubt informs many business decisions and news stories. “Mr.” appeared often as a suggested modification of a CEO’s name. Apparently Google wants us to be proper when searching for the highest earning American CEOs. Education appears for a couple of the CEOs. I’ve always encouraged our clients with a strong tie to their educational background to reach out as an alumni and do their part for the future of America. That sounds quite lofty, but in being a role model for the school, you help promote future attendance, inspire new generations, and positively sculpt your search results. There was only one search for the CEO’s board memberships. 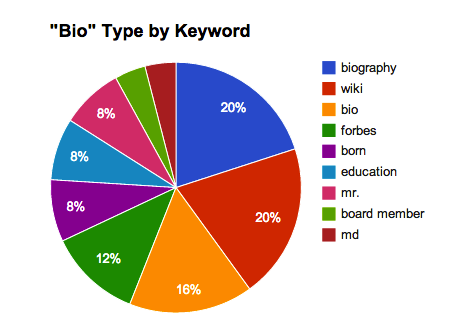 “Wiki” appears to be as commonly searched as “bio” or “biography” so for the CEOs of the world who are scared of Wikipedia, it’s time to accept that this has embedded itself in our vernacular. I’m not sure there was anything surprising here. We all want to know what the richest and most powerful people in the world make–their net worth and their salary. There are also many websites that provide this content for politicians, celebrities, and executives, which only fuels those autocomplete results further. Google can’t display what it can’t find! The most shocking discovery from this exercise was that the only “negative” appeared to be a mention of the Priceline CEO’s email address. While a negative, I want to look deeper at his (and the rest of the top earning CEO’s) search results to determine whether the brand has turned this negative into a positive. Do they own the search results for this query? Are they aware enough to leverage this as a customer service win? I would think that as a CEO it’s a no brainer–your users are telling you what they want. Turn this into a Southwest-style opportunity and capitalize on your values and message as a company. The same could be said for all of the keywords mentioned. We’ll look closer in future posts and I hope this helped spark some creative PR, leadership, or online reputation management ideas for you as well. You’re a Brand. WTF Do You “Pin” On Pinterest?